^ "High Def Digest | Blu-ray and Games News and Reviews in High Definition". ultrahd.highdefdigest.com. Retrieved May 22, 2018. ^ Anthony Alessandro (July 17, 2015). "Universal Hits $5 Billion Faster Than Any Other Major Hollywood Studio". Deadline Hollywood. Archived from the original on December 28, 2015. Retrieved January 14, 2016. 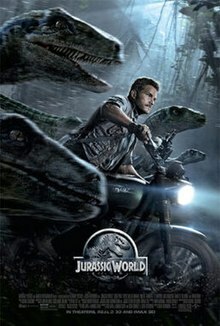 ^ ""A trip down memory lane" Jurassic World review". Movie Metropolis. June 14, 2015. Retrieved June 23, 2018. ^ "Deja Vu: Isn't Jurassic World just Deep Blue Sea with dinosaurs?". Flickering Myth. April 19, 2015.